Chrysler Connection – The Chrysler Connection is a online community dedicated to Chrysler vehicle owners and enthusiasts worldwide. The connection is a great resource for locating personal Chrysler related web sites on the internet. Dodge Connection – The Dodge connection is a online community dedicated to Dodge car owners and enthusiasts worldwide. The connection is a great resource for locating personal Dodge related web sites on the internet. 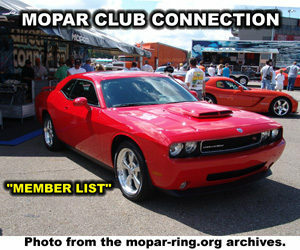 Dodge Challenger Connection – A online community dedicated to Dodge Challenger owners and enthusiasts worldwide. The connection is a great resource for locating personal Dodge Challenger related web sites on the internet. Dodge Charger Connection – A online community dedicated to Dodge Charger owners and enthusiasts worldwide. The connection is a great resource for locating personal Dodge Charger related web sites on the internet. Dodge Dakota Connection – The Dodge Dakota Connection is a online community dedicated to Dodge Dakota Truck owners and enthusiasts worldwide. The connection is a great resource for locating personal Dodge Dakota Truck related web sites on the internet.